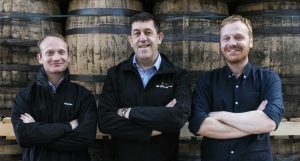 Portmagee Distilling and Brewing Company was founded in early 2017 by two brothers John and James Murphy who are from Portmagee, Co. Kerry. John and James Murphy have a site in Portmagee that used to be the Royal Irish Constabulary (RIC) Barracks until it was burned down during the Irish Civil War. The building subsequently belonged to the Murphy family and has been passed down from generation to generation, it’s last use was as a cow shed. It presently is in a state of disrepair and we are in the process of getting planning permission to restore the building as part of the Portmagee Whiskey Experience. international Whiskey related websites joined the team in mid-2017 and has brought his wealth of Whiskey knowledge and contacts to benefit the enterprise. Launch of Portmagee Non Age Staement Whiskey. Opening of first phase, Portmagee Whiskey Experience and Seine Boat Visitor Centre at Barrack Hill, Portmagee, Co. Kerry. Continuation of brand and development of market. Opening of Portmagee Distillery and visitor experience at Barrack Hill, Portmagee, Co. Kerry. Release of first batch of Portmagee Whiskey and raw materials sourced in Kerry region.